Since the 1990s, the number of parents seeking vaccine exemptions for their children has been climbing, pitting public health against influential anti-vaxxers in a proxy messaging war. But it seems the doctors trying to persuade the vaccine-hesitant — still a tiny minority of parents — have mostly been failing: Either their messages are off or the anti-vaccine campaigns, circulating among sources like conspiracy theorist Alex Jones, are too powerful to counter. The latest evidence of that failure has come in a large measles outbreak in Washington state. As of Friday, there were 41 cases in Washington’s Clark County, which borders Portland, Oregon. Most all of the cases involve children between 1 and 10 years old who had not been vaccinated. “This is important because many of our go-to arguments about herd immunity and keeping your children safe are themed around values of harm and fairness,” said the Emory study’s lead author, epidemiologist Avnika Amin. Public health campaigns typically seek primarily to educate on potential harms, reminding parents that getting immunized helps prevent outbreaks, and protects those who can’t be vaccinated, like people with allergies to vaccines or very young children. But those may not be the values that resonate with vaccine-hesitant parents. The researchers found that parents who were concerned about vaccinating their children scored similarly to parents who weren’t when it came to the morals of harm and fairness. The results suggest that pro-vaccine communications could be strengthened by taking a page from the anti-vax book — and presenting messages that better align with purity and liberty. This finding is extremely important, considering that over the past three decades, the number of parents who opt out of vaccines for their kids has grown. In one 2009 New England Journal of Medicine paper, researchers looked at the state-level rates of nonmedical exemptions and found that between 1991 and 2004, those rates increased from less than 0.98 percent to about 1.5 percent. According to a recent study, we’re now hovering above the 2 percent exemption rate, which translates to thousands more unvaccinated children than just a decade ago. . .
Two narratives commonly emerge in answer to this question. The first focuses on the struggle between democracy and its alternatives, pitting liberalism against fascism, National Socialism, and Marxist-Leninism. The second focuses on competition between capitalism and its alternatives, pitting liberals against socialists and communists. Democratic capitalism is simply the best, indeed the “natural” form of societal organization, these stories assert, and once Western Europe fully embraced it, all was well. This account obviously contains some truth: the century did witness a struggle between democracy and its enemies and the market and its alternatives. But it is only a partial truth, because it overlooks a crucial point: democracy and capitalism were historically at odds. An indispensable element of their joint victory, therefore, was the discovery of some way for them to coexist. In practice, that turned out to mean a willingness to use political power to protect citizens from the ravages of untrammeled markets. The ideology that triumphed was not liberalism, as the “End of History” folks would have it, it was social democracy. If this sounds surprising or overblown it is because social democracy rarely gets either the respect or in-depth ideological analysis it deserves. As a result, a force that has altered the course of European politics in the past and could do so again in the future remains strangely obscure. 3 One reason for this neglect is a simple confusion of terms. During the late nineteenth and early twentieth centuries, many socialists adopted the label “social democrat” to differentiate themselves from other socialists who did not accept democracy. But these figures often agreed on little beyond the rejection of an insurrectionary or violent route to power, making their grouping of limited analytical use. Today the situation is similar, with a wide range of individuals and very different political parties identifying themselves as social democratic and having little in common save some vaguely leftist sentiments and fervent desire not to be identified as communist. Modern scholars, meanwhile, have often failed to appreciate social democracy’s ideological distinctiveness. Most work on the subject in recent decades adopts one of two perspectives. The first, often espoused by critics, sees social democracy as an unstable halfway house between Marxism and liberalism, cobbled together from elements of incompatible traditions. In this view social democrats are socialists without the courage of revolutionary conviction or socialists who have chosen ballots over bullets.1 The second perspective, often held by supporters, sees the movement as an effort to implement particular policies or uphold certain values. In this view social democrats are basically the champions of the welfare state, or “equality,” or “solidarity.”2 Each of these views contains some truth, but both miss the larger picture. Correctly understood, social democracy is far more than a particular political program. Nor is it a compromise between Marxism and liberalism. And neither should it apply to any individual or party with vaguely leftist sympathies and an antipathy to communism. Instead, social democracy, at least as originally conceived, represented a full-fledged alternative to both Marxism and liberalism that had at its core a distinctive belief in the primacy of politics and communitarianism. The key to understanding its true nature lies in the circumstances of its birth. As time passed, however, orthodox Marxism began to run into trouble. To begin with, many of Marx’s predictions failed to come true. By the fin-de-siècle European capitalism had developed renewed vigor after a long depression and bourgeois states had begun undertaking important political, economic, and social reforms. Just as Marxism’s failings as a guide to history were becoming clear, moreover, criticism arose within the international socialist movement regarding its inadequacy as a guide to constructive political action. Parties acting in Marx’s name had become important political players in a number of European countries by the end of the nineteenth century, but orthodox Marxism could not furnish them with a strategy for using their power to achieve any practical goals. Orthodox Marxist thought had little to say about the role of political organizations in general, since it considered economic forces rather than political activism to be the prime mover of history. Around the turn of the twentieth century, therefore, many on the left faced a troubling dilemma: Capitalism was flourishing, but the economic injustices and social fragmentation that had motivated the Marxist project in the first place remained. Orthodox Marxism offered only a counsel of passivity—of waiting for the contradictions within capitalism to bring the system down, which seemed both highly unlikely and increasingly unpalatable. Orthodox Marxism’s passive economism also did little to meet the psychopolitical needs of mass populations under economic and social stress. The last years of the nineteenth century, like those at the end of the twentieth and the beginning of the twentyfirst, were marked by a wave of globalization and rapid and disorienting change.This caused immense unease in European societies and critics, not just on the left but increasingly now on the nationalist right, increasingly railed against the glorification of self-interest and rampant individualism, the erosion of traditional values and communities, and the rise of social dislocation, atomization, and fragmentation that capitalism brought in its wake.10 Orthodox Marxism had little to offer those interested in actively responding to capitalism’s downsides (rather than merely waiting for its collapse) and little sympathy or understanding for growing communitarian and nationalist sentiment. It was against this backdrop and in response to these frustrations that the social democratic movement emerged. As the nineteenth century drew to its close, several socialists realized that if their desired political outcome was not going to come about because it was inevitable (as Marx, Engels, and many of their influential followers believed), then it would have to be achieved as a result of human action. Some dissidents, such as Lenin, felt it could be imposed, and set out to spur history along through the politico-military efforts of a revolutionary vanguard. Others felt that it could be made desirable, and thus emerge through the collective efforts of human beings motivated by a belief in a higher good. Within this latter “revisionist” camp, two distinct strands of thinking emerged. The first was revolutionary and epitomized by the work of Georges Sorel.11 For Sorel, a radical and perhaps violent overthrow of the existing order seemed the surest path to a better future. Socialism, in this view, would emerge from “active combat that would destroy the existing state of things.”12 The second strand of revisionism was democratic and epitomized by the work of Eduard Bernstein. Like Sorel, Bernstein believed that socialism would emerge from an active struggle for a better world, but unlike Sorel he thought this struggle could and should take a democratic and evolutionary form. Where Sorel’s work would help lay the groundwork for fascism, Bernstein’s would help lay the groundwork for social democracy. Bernstein attacked the two main pillars of orthodox Marxism–historical materialism and class struggle–and argued for an alternative based on the primacy of politics and cross class cooperation. His observations about capitalism led him to believethat it was not leading to an increasing concentration of wealth and the immiseration of society, but rather was becoming increasingly complex and adaptable. Instead of waiting until capitalism collapsed for socialism to emerge, therefore, he favored trying to actively reform the existing system. In his view the prospects for socialism depended “not on the decrease but on the increase of…wealth,” and on the ability of socialists to come up with “positive suggestions for reform” capable of spurring fundamental change.13 Bernstein’s loss of belief in the inevitability of socialism led him to appreciate the potential for human will and political action. Orthodox Marxists’ faith in historical materialism, he felt, had bred a dangerous political passivity that would cost them the enthusiasm of the masses. He felt the doctrine of inevitable class struggle shared the same fatal flaws, being both historically inaccurate and politically debilitating. There was actually a natural community of interest between workers and the vast majority of society that suffered from the injustices of the capitalist system, he argued, and socialists should regard dissatisfied elements of the middle classes and peasantry as potential allies ready to be converted to the cause. Bernstein’s arguments were echoed by a small but growing number of dissident socialists across Europe, who shared an emphasis on a political path to socialism rather than its necessity, and on cross-class cooperation rather than class conflict. During the last years of the nineteenth and the first years of the twentieth century . . . 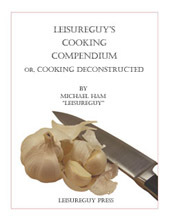 The footnotes are included with the text at the link. Since we are seeing Social Democrats (Bernie Sanders, Alexadra Ocasio-Cortez, et al.) emerge as influential political actors, it seems a good idea to understand their outlook. I did time my shave this morning, though I did not include rinsing out the brush. Total time from wetting MR GLO before washing my stubble at the sink (following my shower) until I splashed on aftershave was 4 minutes 17 seconds, which surprises me a bit. I thought I was still taking 5 minutes. Of course, subjectively the time has been the same since my shaves took 10 minutes or 20: it takes as long as it takes, shaving carefully, paying attention, and not rushing. I focus on what I’m doing and don’t really pay attention to time passing, which is part of what makes shaving so enjoyable. A commenter yesterday sounded somewhat shocked, since he takes longer in applying lather and letting it sit on his face and thought, as we tend to do, that his experience was standard. But men vary a lot in all sorts of ways and one of those ways is how tough, thick, coarse, and wiry their stubble grows. My beard is around average in the toughness and thickness department. At one time I wrote that using a shave stick involved rubbing the stick against the grain over all your (wet, washed) stubble and then brushing. 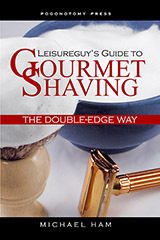 A reader complained about the thickness of the lather he got that way, and in our discussion it turned out that he had a thick, tough, “cheesegrater” beard, and it scraped from the shave stick too much soap for a good lather. I suggested that he rub the shave stick against the grain only in the Van Dyke area around his mouth: chin, moustache, and sides of his mouth. He then used the brush to work up the lather there, then use the lather-filled brush to lather the rest of his beard. OTOH, men who are just starting to shave have soft, sparse, downy stubble that doesn’t scrape off enough soap for a good lather, so they load the brush directly on the shave stick (as shown in a scene in the 1955 film The Dam Busters, where the air crews are taking the afternoon off before setting off on the raid: one of the men decides that a shave is in order in case his plane goes down and he’s rescued). Do what works best for you, and never rush your shave. The idea of the annual timed-shaving exercise is just to observe that the clock time required generally drops as experience brings efficiency even if the subjective time doesn’t change. I used a glycerin-based soap in the tub today, just to see what that lather is like. 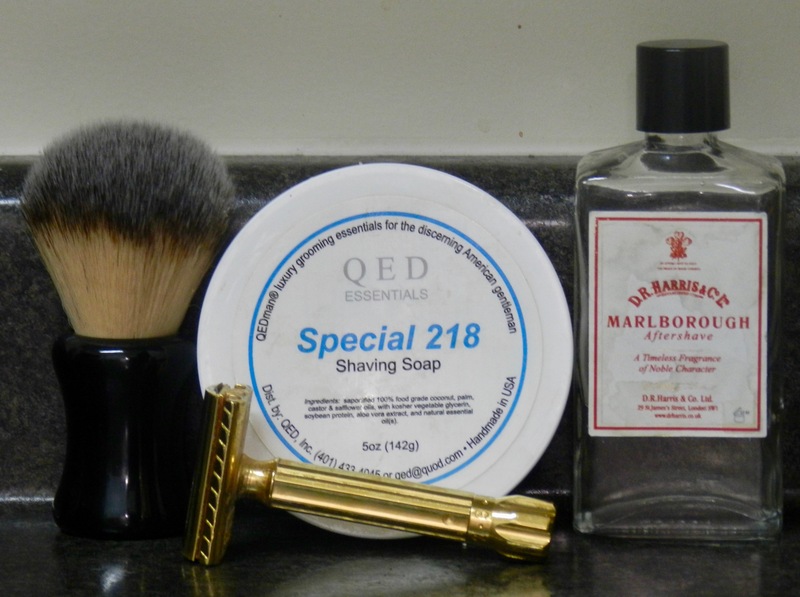 It’s the same excellent lather as the glycerin-based soap sticks: very creamy and thick—and in this case, redolent of cedar and pin from QED’s Special 218, which I’ll be using again in a couple of weeks. The RazoRock Bruce synthetic did an excellent job, but I now want to try a badger brush with this soap to see if the nature of the lather is affected. Three passes with the Merkur Progess took very little time, and then a rinse of the razor, a rinse of my face, dry, and a splash of D.R. Harris Marlborough (also a woody fragrance) finished the job.